The seventh edition of Basic Biomechanics has been significantly updated from the previous edition. The approach taken remains an integrated balance of qualitative and quantitative examples, applications, and problems designed to illustrate the principles discussed. The seventh edition also retains the important sensitivity to the fact that some beginning students of biomechanics possess weak backgrounds in mathematics. For this reason, it includes numerous sample problems and applications, along with practical advice on approaching quantitative problems. 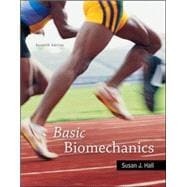 With balanced, integrated coverage of applied anatomy, mechanical principles, and relevant sport and daily living applications, this text introduces you to the basics of biomechanics. The quantitative aspects of biomechanics are presented in a manageable, progressive fashion, with practical advice on approaching both qualitative and quantitative problems in biomechanics.